NOTES: Resin kits with vac canopy. The Mitsubishi Type 96 Carrier Fighter (A5M) gained fame for being the world’s first operational carrier based, low-wing monoplane fighter. The design incorporated many unique features and gave the Japanese aeronautical engineers confidence that they could produce designs that could complete on the world stage. The aircraft began flight trials in February 1935 with the first delivery of the A5M1s to units in early 1937. The success of the early Navy prototypes attracted the attention of the Army, who in turn ordered an experimental version designated the KI-18. Although faster than the contemporary KI-10, it was less maneuverable in dog fighting tests and was rejected. An upgraded version, the KI-33, was developed to improve its dog fighting ability. However, this version lost the production competition to the KI-27. The Army lost interest in the design. Fortunately, the Navy was not as adamant about maneuverability and the A5M was accepted. As the Sino-Japanese conflict flared in July 1937, the A5M2 began supplanting the earlier version. These planes established air superiority in the skies over China. Further developments of the design included the unsuccessful inline engined A5M3 armed with a 20mm cannon firing through the propeller hub. The engine was supplied by the French. However, the Japanese did not want to rely on a foreign supplier and the A5M3 was dropped. The definitive version of the plane was the A5M4. By 1941, most A5M had been relegated to second line roles. Even so, the Allies gave the A5M the code name CLAUDE. In 1942, the A5M4-K two-seat trainer became operational. CLAUDEs ended the war as so many other types, they died as kamikazes. The KI-18, A5M3 and the A5M4-K were all metal aircraft with fabric covered control surfaces and fixed undercarriage. The KI-18 was powered by a 550-600 hp 9-cylinder Kotobuki 5 radial engine driving a metal fixed-pitch two-blade propeller and was armed with two fixed forward-firing 7.7mm Type 89 machine guns in the upper decking of the fuselage. The A5M3 was powered by a Hispano-Suiza 12Xcrs 610-690 hp 12-cylinder Kotobuki 5 inline engine driving a metal three-blade propeller and was armed with a 20mm Hispano cannon firing through the propeller hub. The A5M4-K was powered by a 710-785 hp 9-cylinder Kotobuki 41 or 41 KAI radial engine driving a metal variable-pitch three-blade propeller and was armed with two fixed forward-firing 7.7mm Type 89 machine guns in the upper decking of the fuselage. All versions could carry two 30 kg bombs could be carried outboard of the landing gear and an external fuel tank could be slung on a centerline rack. Another member of this series, the A5M2b, has previously been previewed. These kits are beautifully cast with fine details in tan resin. The kits have about 40 resin parts. The molding is crisp with some flash. There is a fair amount of flash; however it is not excessive with most occurring where needed to preserve fragile parts. The clean up will require some time to remove all the flash and to detach the parts from the casting frets, however no more clean-up than the typical resin kit will be required. The craftsmanship is excellent with some bubbles. There are a few more bubbles than previous Choroszy releases, but again they are not excessive and are easily fixed. The kits have full interiors and very fine surface detail. The fuselages are as thin as many plastic kits, but do not seem fragile. 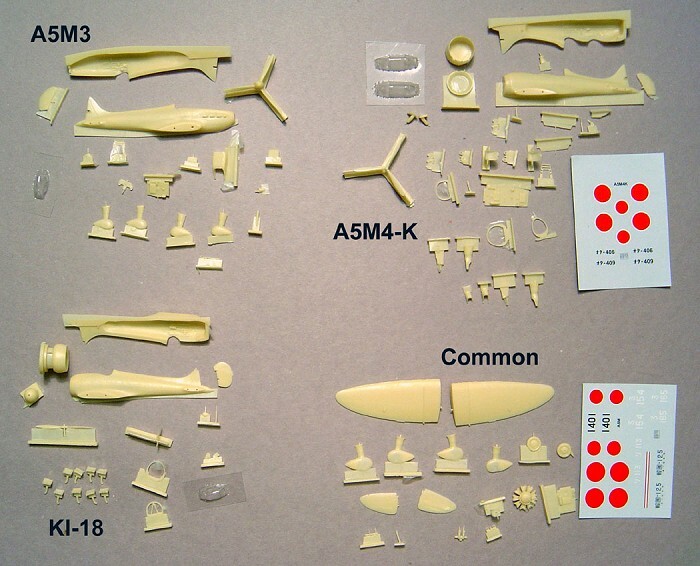 The KI-18 and A5M3 kits include the same decal sheet as the previously reviewed A5M2b kit. The decals are well printed thin decals for 4 aircraft, however, the KI-18 only has one option and the A5M3 will only use the Hinomarus. There are no decals for the A5M3 depicted in the box art. The rest of the decals appear to be for the A5M2 or “hypothetical” markings. The A5M4-K decals have markings for two planes in a green over trainer orange scheme. The kits scale-out basically bang-on. All measurements were within a millimeter or less of the dimensions listed in reference 3. While going over the kit (as I am frequently finding out with Choroszy kits), I found details that had not previously caught my attention on a CLAUDE. Sure enough, when I checked my references photos, they were there. Choroszy Modelbud has done their homework as usual! Thanks! I would recommend these kits to the average modeler who is not afraid of building a resin kit. The kit parts are well packaged in separate small zip-lock type bags. The kits also contain 2 duplicate vacu-formed canopies. I always appreciate duplicates as I invariably damage one during construction. The canopies are clear, but have heavy, out-of-scale framing. The directions consist of 2 sheets front and back. (One side for the three-view of the plane, one half side for history, 1 and a half for the exploded view construction directions, and one side for the camouflage schemes). The exploded views are not crowded and most modelers will be able to follow them. One drawback is that some of the interior parts are not detailed in the views. Using the available references, the average modeler will have little problem figuring out where they belong. With all the interior detail parts that Choroszy Modelbud provides, many modelers will want to super detail the cockpit. However, this is not needed as it will look great even if you don't add a thing! Overall, the heavy detail on the clear parts and the omissions from the instructions may be the only draw backs to these kits. 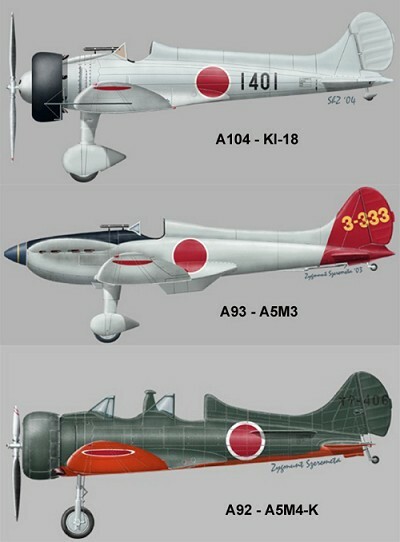 These kits from the A5M series are a welcome addition that will complement the Fujimi CLAUDE series. An average modeler will have no problems constructing this model and I look forward to building this kit. This leaves only the earliest A5Ms (A5M1 and early A5M2a) absent in this scale. As of this writing, Choroszy has just released the KI-33 (kit# A106) to supplement the series. In general, Choroszy kits are hand-made, limited-production, museum quality kits and you get what you pay for. 5) Januszewski, T., Mitsubishi A5M Claude, Mushroom Model Magazine Special #6107, Mushroom Model Publications, 2003. 6) Model Art Special #327, Handbook of Japanese Aircraft 1910-1945, Model Art Modeling Magazine, March 1989. The Author wishes to thank Choroszy Modelbud for the evaluation samples.